The poor shoemaker has only enough leather left to make one last pair of shoes. But during the night, help comes from an unexpected source… A favourite fairytale is retold for new readers in this charming Read It Yourself book, which combines a richer, wider vocabulary with clear and beautiful pictures to support learners and capture their attention. 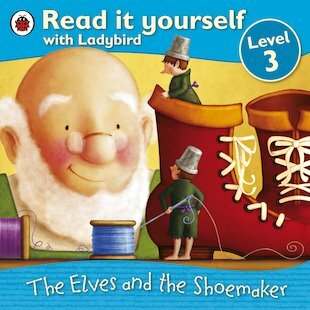 Perfect for building stamina and self-reliance, the book includes puzzle questions for checking comprehension, and belongs to Level 3 of the scheme, for children who are developing their confidence and can read simple stories with help. I liked the part when the elves got new clothes and were very happy. Fairy Tales are so special in our childhood and even as we age and read different things we still think of them as classics that will never fade. the elves and the shoe maker is particularly good.